From the Department of Emergency Medicine (Sunder), Royal Inland Hospital, Kamloops, BC; and the Department of Radiology (Tyler), Queen’s University, Kingston, Ont. A 27-year-old male driver in a single-vehicle rollover collision was transferred to a trauma centre after stabilization and endotracheal intubation at a community hospital. He had been wearing a seat belt. Other than notation of the patient’s fluctuating score on the Glasgow Coma Scale and movement of his four limbs, a neurologic examination was not documented before intubation. After transfer, a bloody discharge was noted from his right external auditory canal, and the right tympanic membrane was perforated. The patient had no Battle sign (i.e., bruising over the mastoid process). The fluid from his ear dripped onto the bedsheet, showing a “halo” pattern (Figure 1). Computed tomography (CT) of the patient’s head showed, among other injuries, a transverse fracture of the petrous segment of his right temporal bone (Appendix 1, available at www.cmaj.ca/lookup/suppl/doi:10.1503/cmaj.120055/-/DC1). 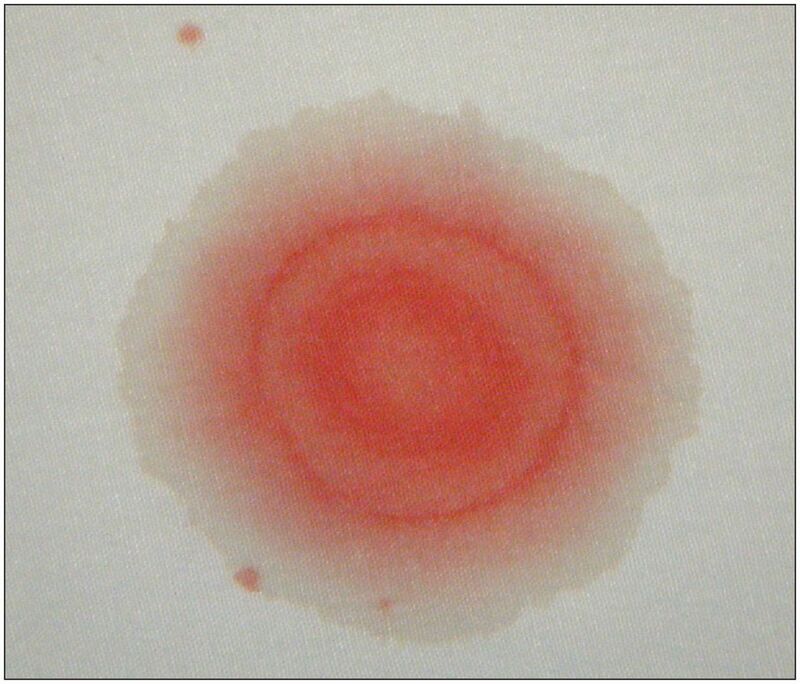 A halo pattern on a bedsheet produced by bloody otorrhea from a 27-year-old man who had been in a motor vehicle collision.
. Positive predictive values of selected clinical signs associated with skull base fractures. J Neurosurg Sci 2000;44:77–82, discussion 82–3.
. The ‘ring sign’: Is it a reliable indicator for cerebral spinal fluid? Ann Emerg Med 1993;22:718–20.
. Antibiotic prophylaxis for preventing meningitis in patients with basilar skull fractures. Cochrane Database Syst Rev 2011;(8):CD004884.